Pour d pepper and onions and boil. Add crayfish,‎salt, Ponmo and boil when it's well cooked, add d washed and cut vegetables and let it cook for few mins. You can bring out d crayfish and Ponmo after its cooked, so u can pour in d vegetables, after the vegetables is cooked, pour back d Ponmo and crayfish into d pot and let it simmer for a minute. 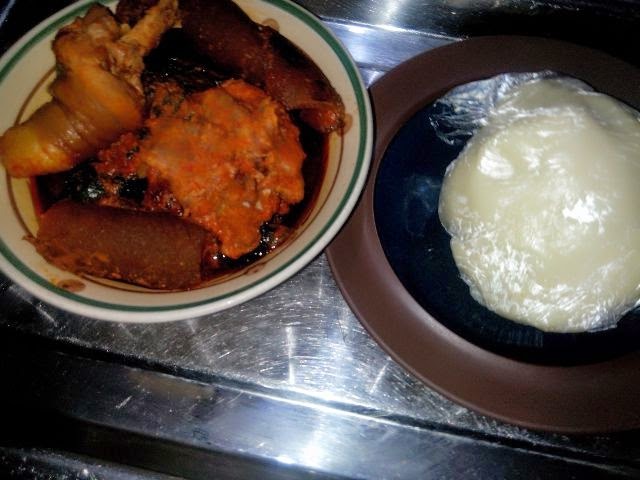 Pounded yam plus Efo Worowo plus chicken and Ponmo. It goes with Amala too.